Reference number for this case: 19-sep-54-Epinal. Thank you for including this reference number in any correspondence with me regarding this case. HAVE THE FRENCH GONE CRAZY? This Epinalian with a worried and yet juvenile countenance (right) points out the position in the sky of an object that made a brief appearance in his life. "It was 06:30 p.m. The night was falling. I was crossing the bridge over the Moselle at Epinal. Suddenly, I saw a melon-shaped object in the sky, traveling from east to west at the speed of a bullet." So spoke Jacques Tollot, aged 14, who works at the butcher shop of Mr. Thouvenot. The same day, and on following days, other good folk were seeing other "ships" plough the sky in all parts of France. The flying saucers' Tour of France had begun. French ufologist Aimé Michel notes that on September 19, 1954, at 06:30 P.M., a single witness at Epinal in the Vosges reports to have seen "a reddish disk with a lighter halation" above the city, which crossed the sky in one minute. The two authors report that on September 19, 1954, at 06:30 p.m., in Epinal in the Vosges, a huge dark yellow ball surrounded by a paler yellow circle was observed. They indicate the newspaper "La Liberté de L'est" for September 23, 1954, as source. "THE SAUCER OF THE DAY LOOKED LIKE SATURN"
"I saw it during one minute" the young butcher apprentice of Epinal claims. "Sunday evening at 6.30, I was on the bridge of the 170th R.I. going in direction of the Square of the Vosges when automatically I looked up in the air. And I then saw an enormous ball (it appeared to me with a diameter a little lower than one meter moving at a relatively strong speed in direction of the Castle coming from the station. It was of a dark yellow colour, surrounded by a large circle of a paler yellow." Whereas we ask him whether it had not been folled by the sending of a kid's balloon or any other appearance, he answered firmly "no, I have well seen it during one minute approximately then it disappeared." Luc Chastan indicates that in the Vosges in Epinal on September 19, 1954 at 18:30 hours "an enormous dark yellow ball surrounded by a paler yellow circle is observed." The website indicates that on 19 September 1954 at 18:30 in Epinal, France, "A flying disc was observed. One red disc was observed by one witness in a city for over one minute." 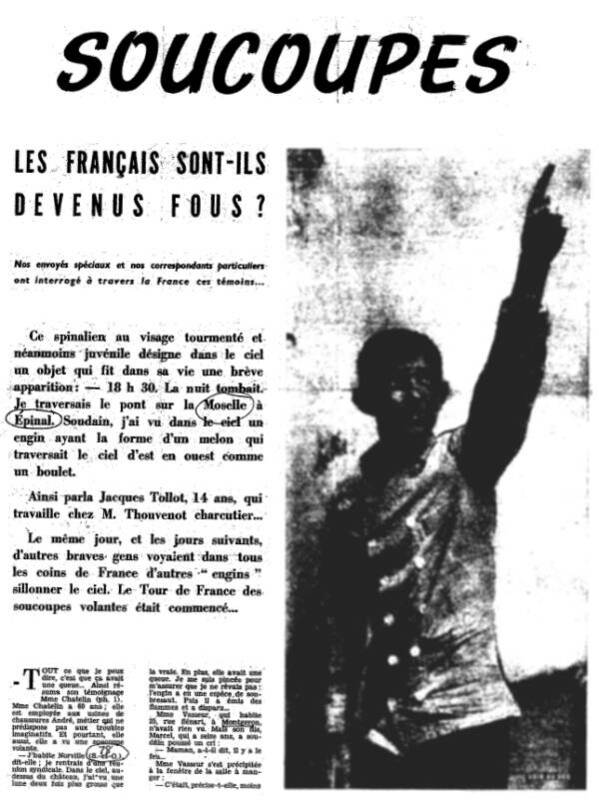 [---] Article in the regional newspaper La Liberté de l'Est, France, September 25-26, 1954. [ra1] Article in Radar magazine, extract, Paris, France, October 17, 1954. [am1] "Mystérieuses Soucoupes Volantes", book by Aimé Michel, Seghers publisher, France, page 85, 1958. [cn1] "Catalogue Rétroactif 1954 des Cas Vosgiens", article by the ufology group CNEGU, in the ufology magazine Lumières Dans La Nuit (LDLN), France, #263-264, page 40, May/June 1986. 1.0 Patrick Gross June 16, 2009 Conversion from HTML to XHTML Strict. First formal version. Additions [lc1], [ud1].